Definition - What does Bakasana mean? Bakasana is an arm balance asana in yoga. The practitioner can begin either in crow pose or, for a more advanced transition, in a head stand. From crow pose, the practitioner straightens the arms to imitate the longer legs of the crane. From a head stand, the practitioner lowers the legs and redistributes the weight of the body until the bent knees are near the arm pits and the buttocks are lifted. While bakasana is often applied to both crane pose and crow pose, it refers solely to crane pose. 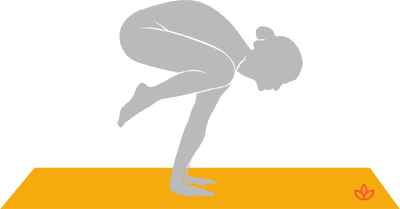 As described above, the arms are bent in kakasana (crow pose) but straight in bakasana (crane pose). In straightening the arms, the practitioner mimics the crane's long, graceful legs and regal stillness.